We are all a little blue at Oaf Towers this week as we have had to say goodbye to one of our bestest oafettes, Sarah also known as Bish. Sarah joined Lazy oaf over 2 years ago as an intern and then became our spangly brilliant Store manager and all round creative genius / funster. She is leaving the big smoke for amazing adventures around the world. We are all extremely jealous and want lots of updates! Sarah has been the face of Lazy oaf and I'm sure If you have ever been into our store at Kingly Court and seen two girls dancing around, the one trying to bogle is probably Sarah! Sarah has kept the shop going and produced amazing shop displays and has come up with ideas for some of our greatest OAF products such as a Godzilla t-shirt, a Bugsy Purse and helped me design the New Look Shop. She is always coming up with ideas and I love it, as we always seem to be thinking the same things, we have schemed several events that never quite made it but those that did have been a great success such as our recent fete and beardarama. The one's that never made it range from a 'furry' B-Boy dance off, Lazy Oaf's Next Top Model and an East 17 video cover. 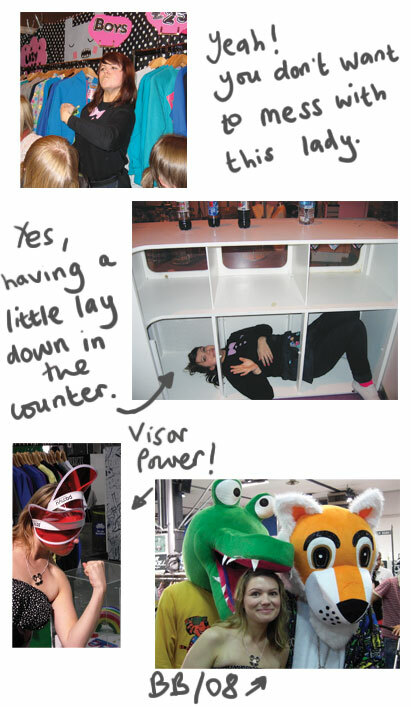 There is sooo much we want to say about Sarah and her time at Lazy Oaf but it would go on and on and on. Suffice to say Sarah was super fun! This is what we will miss: Novelty Jumpers Amazing Hair styles Random embarrassing Ipod songs Rabbits and Dogs in costume pictures Green Tea Hummus Shoes.... a lot of. Drinking as much as possible at free bars Jump suits Honesty Putting her foot in it! Jumping around the shop. Amazing dinners. Chats about nonsense. Her willingness to have a go at anything. Weird noises. Allergies Never having Anti - histamines. Personally I am going to miss our chats, Pomple Mousse will Live ON!! So, we all want to wish you all the luck in the world with your adventures, i'am sure you will have lots of fun! Thank you for being an amazing oaf and a brilliant friend. And in Big Brother Stylee here are some of your best bits that I have scrabbled together.